1. How many collection points are there in Montana for recyclable materials? 2. How much do we recycle in Montana? How does it affect our economy? 3. Why are some materials recycled and not others? 4. What happens after materials are collected for recycling? 5. Where are the markets for recycled material? 6. Why is it important to buy recycled-content products? 7. What are the biggest obstacles to recycling in Montana? 8. Will recycling pay for itself? 9. Can we reduce waste disposal costs by increasing recycling? 10. What is Pay As You Throw, or variable disposal rates? How can they help reduce waste? 11. Are there any incentives to recycle or reduce waste in Montana? In Montana there are more than 100 recycling collection points for materials, collecting 15 materials. 90% of Montana citizens live in communities that offer some type of recycling. Aluminum beverage cans, newspaper, cardboard and non-ferrous metals are the most widely collected materials. Click here to go to the Recycling Center Locator. The Montana Department of Environmental Quality collects information on recycling rates through an annual survey. Montana’s recycling rate, including composting, was estimated at 19% in 2014. This estimate was derived from a voluntary industry survey that included public, private and non-profit recycling entities. These numbers include composted material in addition to traditional recycling. You can view the DEQ’s summary reports here. 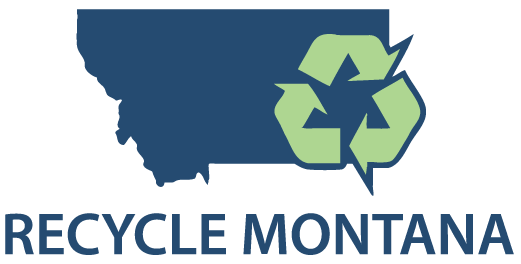 The most commonly collected recyclables in Montana are higher value fibers such as corrugated cardboard, newsprint, magazine and office paper (often collected with newsprint), and metals such as steel and aluminum in cans, scrap metal or old appliances. The established infrastructure and higher market value for these commodities more readily cover the costs of collecting, bundling, and shipping the materials for end use. Items such as plastics, glass, and electronic waste have less established recycling network and additional challenges throughout the recycling process. In the case of plastics, there is a high volume that can be difficult to consolidate (think of all the air in one milk jug!) and many types of grades that can be less valuable and more difficult to sell when mix. Glass is a heavy item, which is difficult to economically and environmentally ship to an end use markets. It is better used locally as has been shown by demonstrations through partnerships by Headwaters Recycling, which has pulverized glass for use in landscaping and construction projects across the state. Electronic waste is more specialized and can require special handling and labor to dismantle in recyclable components. Yellowstone E-Waste Solutions has overcome this challenge by including a fee to cover this cost for some items. They provide a drop-off locations in Billing, partner with the City of Helena once a month, and provide collection across the state through events and pre-scheduled pickups. Many retailers and manufacturers provide in house program collection or mail-in programs as well. Materials are transported from home recycling bins to recycling businesses by curbside recycling programs, or more often in Montana, by citizens using drop-off bins that are collected by recycling programs and sent to recyclers. Employees at Montana’s recycling businesses then sort, bale and prepare the materials according to processor specifications prior to shipment by rail or truck. Each material has its own market, with its own requirements. There are some markets within Montana for processed materials; however, because of our low manufacturing base, most materials are sent out of state. The State of Montana offers tax incentives to encourage more businesses to utilize recycled materials in operations and products and thereby create more in-state markets for recycled material. People sometimes think that the local recycling center that takes their separated material is the market. People say that they are willing to separate more materials and bring them in if only the recycler will take them. Or, some people think that if their community starts a curbside recycling program that will “solve” recycling. The local recycler is only one part of the recycling market, and curbside or other collection programs are only the beginning of recycling. Markets are the meeting of willing buyers and sellers, who agree on the product, price, and transfer of goods. Local recyclers market materials to mills in the U.S. and all over the world. Mills use the recovered material and produce new material, which is the feedstock for manufacturers. Consumers buy recycled content products or packaging, and separate and take the recovered material to recycling collection programs in their community. That’s why recycling has been described as a closed loop, with many market participants. Buying recycled-content products “Closes the Loop” on recycling and supports manufacturers that provide markets for collected recyclables. The Montana Guide to Buying Recycled Products provides information about products available in Montana that contain recycled-content. Products include clothing, construction, paper, equipment and more. There are almost no mills in Montana. Most mills are located close to their customers, the manufacturers who use recycled content materials in their products. As a result, materials collected for recycling in Montana are sent all over the U.S. and even other countries. That means that transportation costs are large, making heavy or bulky items especially expensive to recycle in our state. Adding to the challenge is the fact that Montana has a small population, and we generate less recoverable material. Therefore it may take longer to accumulate enough material to make the minimum quantity a mill will accept. Additional costs may thus be incurred for warehousing or holding material until a sufficient quantity is collected. The price for recovered material fluctuates widely. In extremely good times of strong market demand, recycling collection programs can pay for themselves, especially with revenues from metals. However, to keep a recycling program alive in a community during poor market conditions, it is important to keep the collection costs low and plan for sustainable long-term collection. This can include working to connect existing solid waste infrastructure in support of recycling, focusing on a limited range of commodities, and taking other steps to ensure collection can weather weak markets by breaking even when commodity revenues are lower. The cost of trash disposal is made-up of fixed costs and variable costs. Fixed costs remain constant if there are 1 or 100 tons of waste. Examples of fixed costs are personnel and equipment. Variable costs, such as fuel and tipping fees, change in direct proportion to the amount of waste. In reality, waste disposal costs are more like step-costs, which do not change unless the amount of waste changes considerably. For example, if waste increases substantially, additional employees or equipment may be needed. By reducing the amount of waste we dispose of, recycling can reduce some costs for trash disposal. But in reality, recycling will probably not result in large cost savings unless it reduces a significant part of the waste stream. The basic idea behind variable disposal rates is simply that “you pay for what you throw.” Rather than charging all households a flat fee for trash disposal, households with more trash would pay more than those with less trash. This provides an incentive to reduce waste and increase recycling. It’s a good idea, if everybody plays by the rules. The DEQ has information about some Montana communities that have Pay As You Throw programs. Most businesses already pay variable rates. They contract to have a container on their premises and hauling and landfill fees are based on weight. However, many businesses find it necessary to lock their dumpsters to avoid illegal dumping. If people are willing to put trash in a business dumpster to avoid paying fees at the landfill gate, they may be willing to illegally dump trash on roadsides, ditches or in their neighbor’s trash container to avoid paying fees. Whatever rates a community decides to set for disposal, it should cover the amount of trash an average household produces in a year. Public education programs can help consumers reduce the amount of waste they generate through source reduction, reuse and recycling. Some pay as you throw programs in larger communities across the country control the cost of trash through different bins sizes, weighing of trash with collection trucks, or requiring purchases of specially marked trash bags. In such collection systems, the pay as you throw component is often focused on the trash, while the collection of recyclables is encouraged by a lower rate or zero charge. The Montana Department of Environmental Quality has information about tax incentives provided to encourage businesses to invest in recycling equipment and to purchase materials with post-consumer recycled-content, including compost. Contact the Department of Revenue in Helena (406-444-6900) with questions about using the tax incentives.